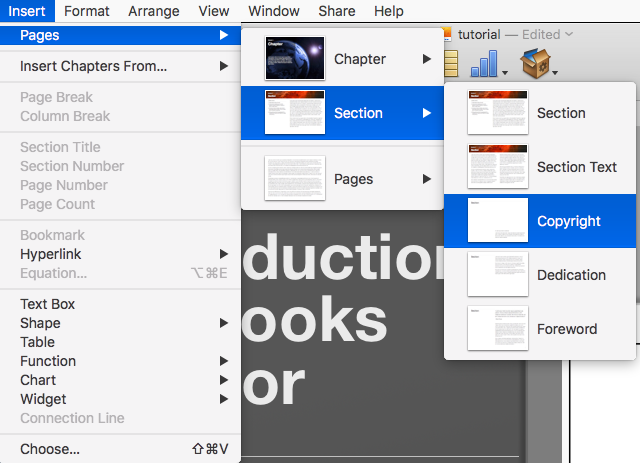 In this iBooks Author tutorial, you’ll learn how to create a book in iBooks Author from scratch – complete with embedded video, interactive quizzes, and more. You’ll see how easy it is, and will be making your own book in no time! 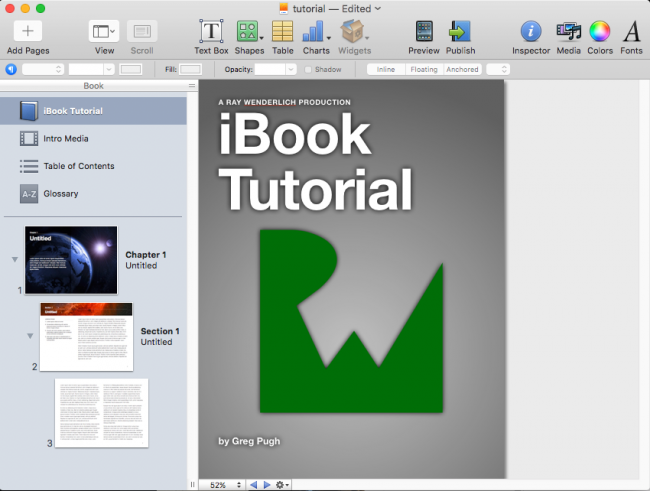 Learn how to make an eBook with iBooks Author! If you’ve ever had the itch to write your own book, it’s never been easier than now! eBooks: Now that eBooks have become popular (and even preferred by many), you no longer have to worry about physically printing your books in order to sell them. Online stores: The other big change is that online stores like iBooks or Amazon.com allow independent authors to submit their books directly, without having to go through the hassle of making a book deal with a major publisher. So this means to create and sell a book, all you have to do is create a file! 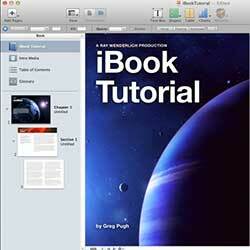 And one of the best tools to create eBooks for the Apple iPad is iBooks Author. 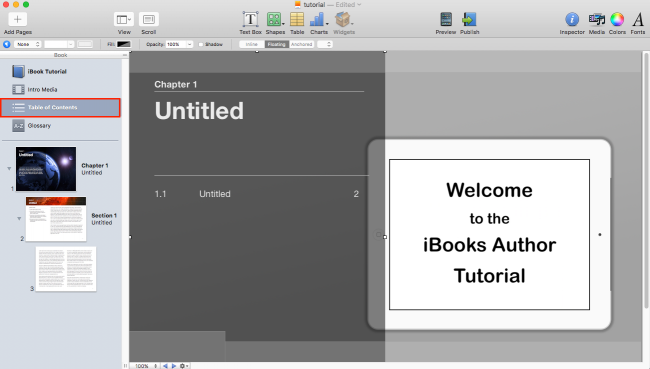 In this iBooks Author tutorial, I’ll show you how to create a book in iBooks Author from scratch – complete with embedded video, interactive quizzes, and more. You’ll see how easy it is, and will be making your own book in no time! Note: that to use iBooks Author, you’ll need a Macintosh computer running OSX 10.11 or later and if you’d like to do previewing, an iPad with iBooks 3.0 installed on it. Believe it or not, you’ll accomplish all that in this tutorial alone! Keep reading to find out how to get started. iBooks Author is a free download on the Mac App Store. 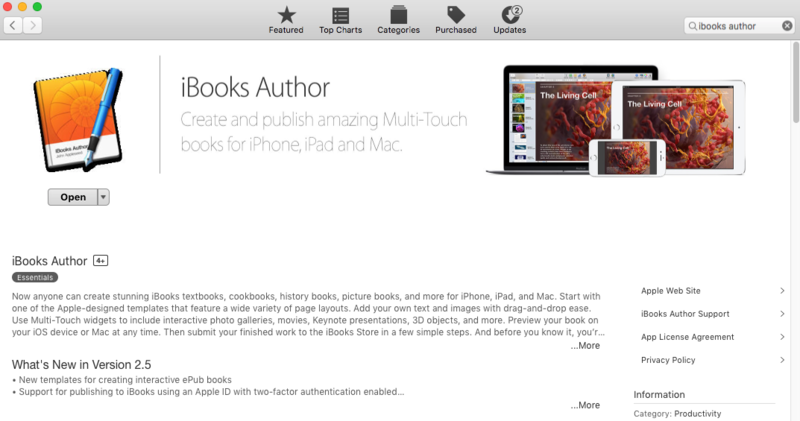 Just search for “iBooks Author” in the App Store, or follow this direct link to the app. 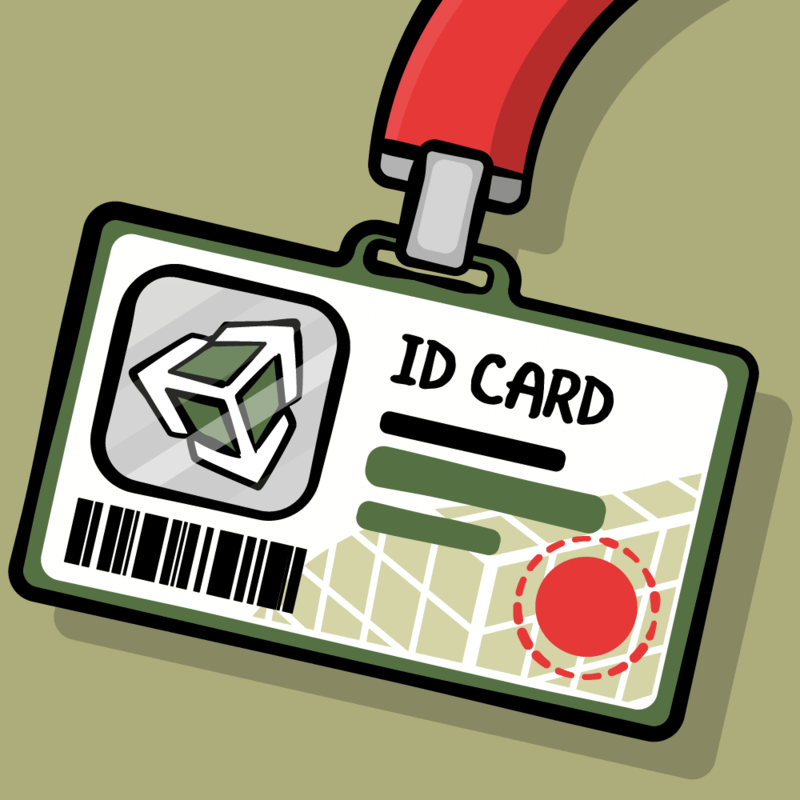 You can download all of the source files needed for this tutorial here. This compressed folder contains all of the media assets that you will need for this project, and it also contains the completed iBook for reference. Save the folder to your desktop or some other easy-to-find place that you can access from iBook Author. Minimal setup — things are looking good so far! The next section shows you how to create your iBook from the library of existing templates available. With your new template open, navigate to File\Save, and save your project as iBookTutorial inside the iBooksAuthorTutorial folder that you downloaded in the previous section. As with any project, it’s a good habit to save early and often. 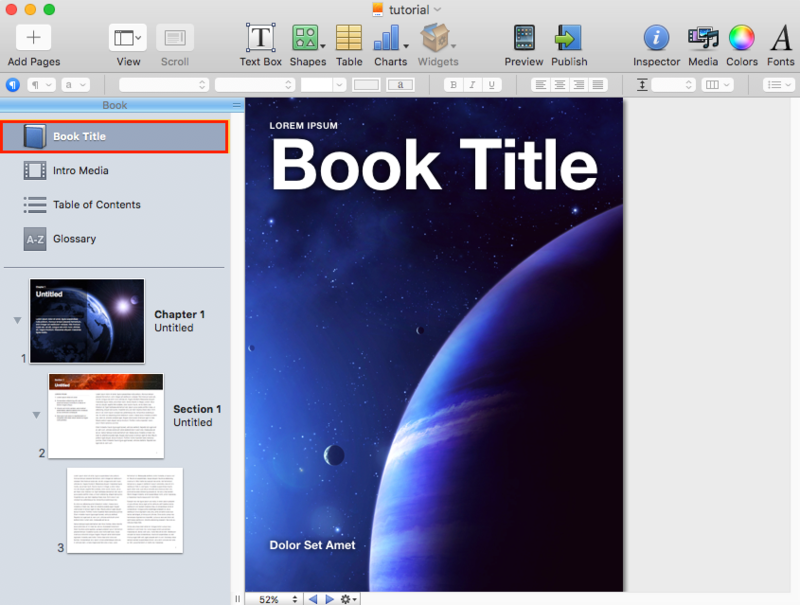 Fill in some basic information about your book in the Document pane, such as your name, the title of the book, and some basic notes about the book. Now that you have the basic information entered about your iBook, it’s time to set up the first thing your readers will see — the cover! 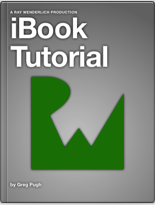 If you’re not happy with the basic cover art that iBooks Author provides, you can also add your own artwork for the cover. 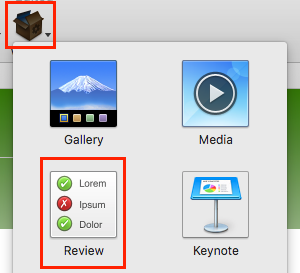 In the iBooksAuthorTutorial folder that you downloaded, find the Media folder. In this folder, you will see a file named cover.png, which is the artwork for the cover of your book. Drag cover.png from the Media folder onto your cover page, which will replace the current blue planet cover with your new shiny artwork. That’s all there is to it! This is the cover that readers will briefly see as the book opens on their iPad. It won’t be seen very long at full resolution, but it’s still a good idea to have a nice custom cover image to make your book stand out. The cover image in this tutorial is 1024×1536, which is half the width of an iPad 3 screen and full height. Images that you would like to fill the entire screen should be 2048×1536 if you’re planning to support iPads with Retina displays. 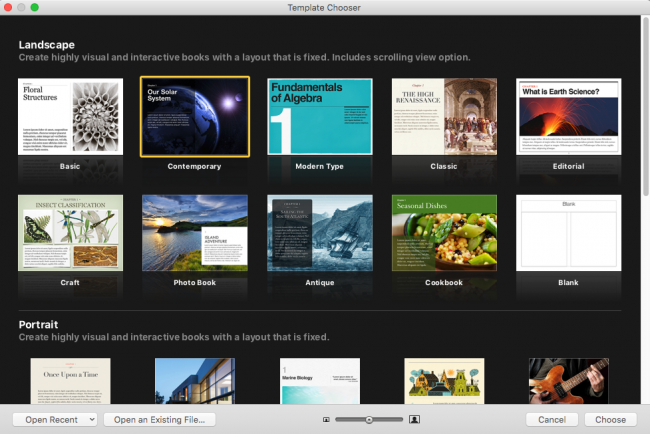 A nice cover is a good feature, but you’re creating an interactive iBook here, and you can always take it up a notch! 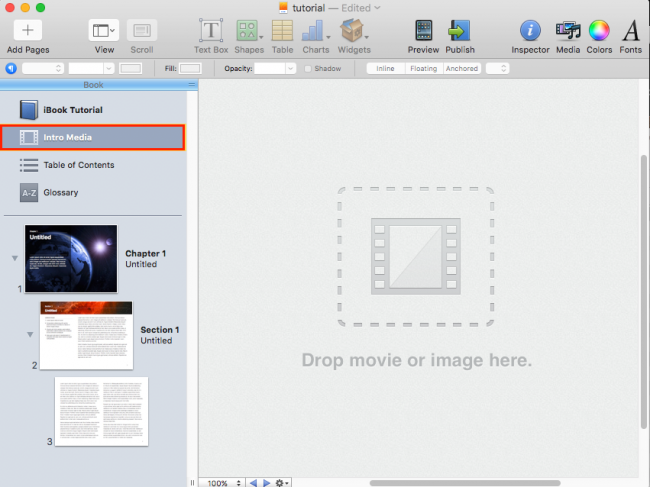 iBooks Author allows you to add an introductory video to your iBook which will play when the user opens your book. iBooks have a neat feature where when the book first starts, it can play a movie. This is a great way to introduce the book with something interesting and motivating. Be patient; iBooks Author might need a few seconds to process the video. Once the processing is complete, hit the play button and watch the exciting intro video! If you choose not to have a video as your Intro Media, you can instead use a still image. 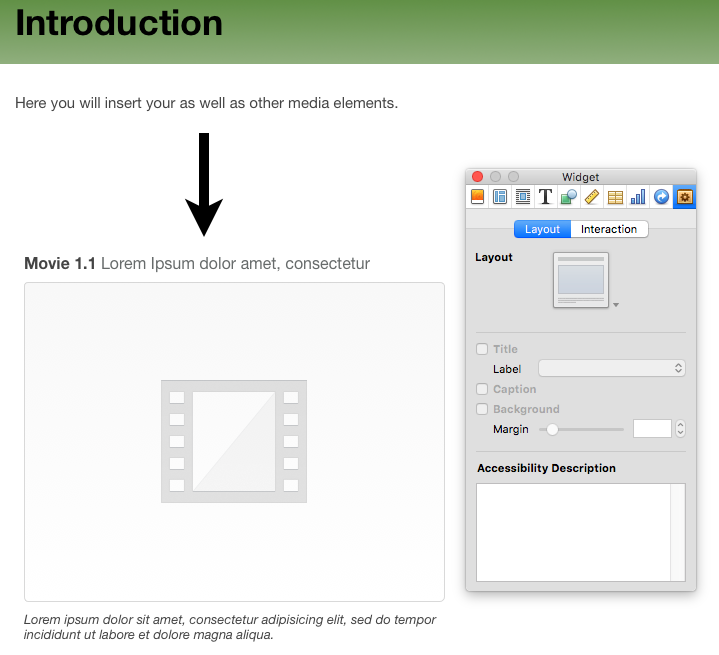 If you opt not to use any intro media, then your iBook will open directly to the table of contents. 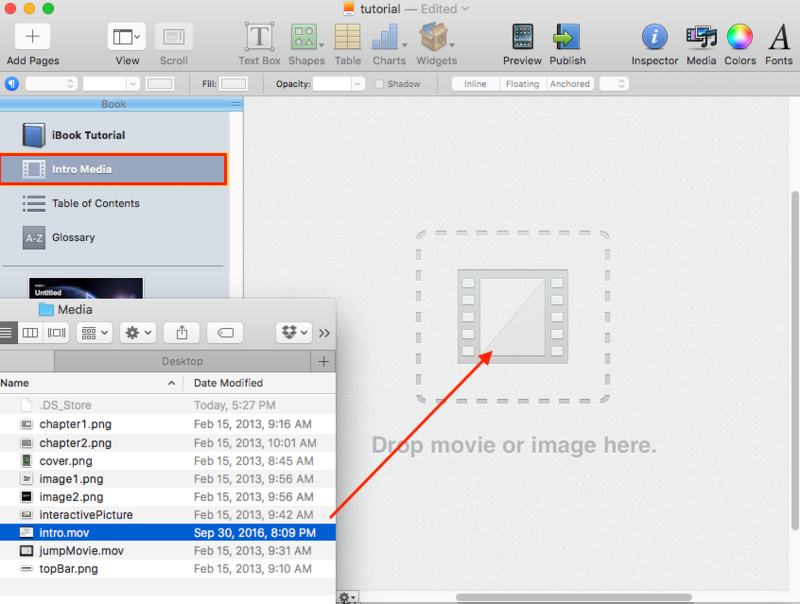 Note: Videos will only play when exported in the iBooks format. 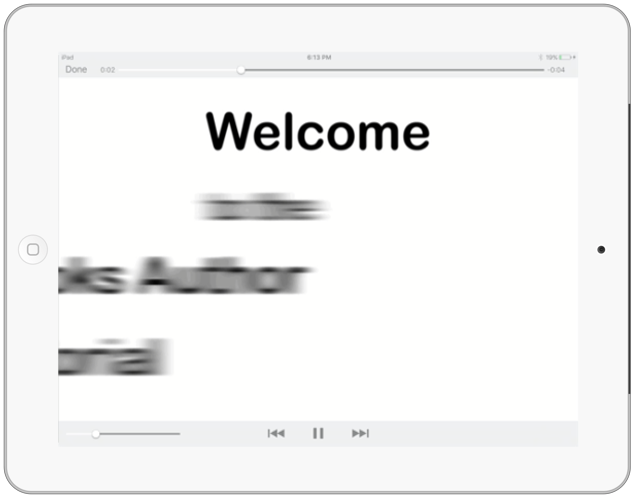 The Intro Media screen will be skipped for the PDF and Text versions. Keep this in mind if you plan to offer your book as both an iBook and a PDF! 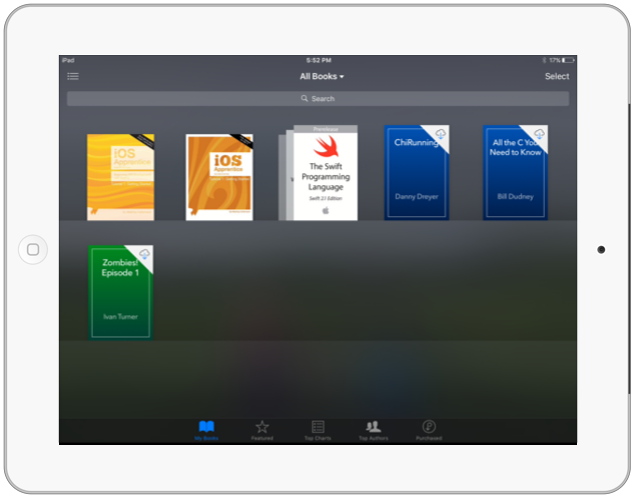 Check out your iPad — there’s your book in action! After only a few mouse clicks and some dropping and dragging, you’ve created a working iBook! Huzzah! However, aside from the cover and the Intro Media, there’s not much content to your book! You’ll now add some more content to your iBook — and what better place to start than the Table of Contents? 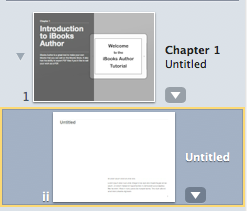 Now that you have a chapter defined in your table of contents, you can add some images and text to it. You can easily add and remove whole pages, and even sections, from your iBook — the next section talks about just that! 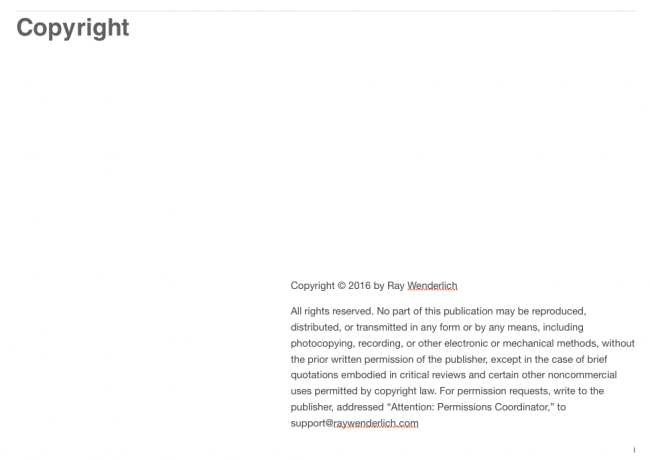 You want to make sure that no one is going to steal your content and make millions off of your hard work, so you’ll need a copyright page in your iBook. With Section 1 highlighted, press delete on your keyboard. 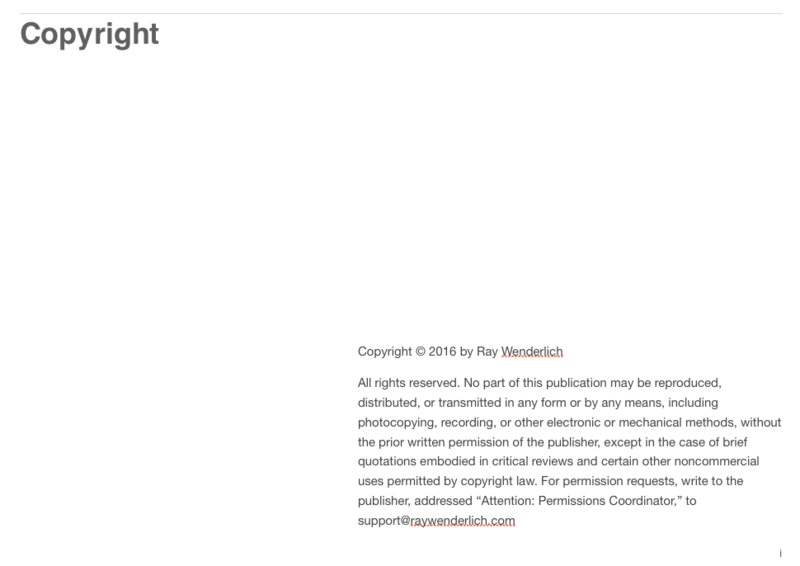 That takes care of the unwanted page, but what about a copyright notice? That’s all there is to adding pages and rearranging them in your book! A cover and copyright page hardly constitute a book, so it’s time to add some more sections to your chapters and flesh them out! 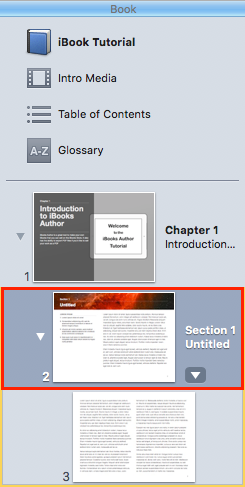 With Chapter 1 selected in the Books pane, insert a new section to replace the one you deleted in the previous part. Now that your new Section Text page is in place, folder, locate topBar.png in your Media folder and drag it into the header of your page to replace the starry red background. Be careful here: you don’t want to drag the image to either of the text fields, but only to the background image! Change the font color to black. Save your work (you are saving regularly, aren’t you? :]) and click Preview to admire your work on your iPad. It’s a good idea to preview your iBook occasionally on your device to make sure things are looking the way you want! Here you will insert your as well as other media elements. What if you want to add some basic shapes – arrows, speech bubbles, and the like – to your book? You could open up drawing or photo editing software and create them there — or you could use the handy tools built right into iBooks Author! 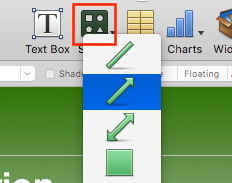 The benefit of using the built-in tools for adding basic shapes to your book is that everything is in one place and you don’t have to create your image somewhere else, export it, and then import it into iBooks Author each time you need to make a change. You’re a budding author who is about to become famous — you don’t have time to waste on things like that! This will insert an arrow right in the middle of the current page. You’ll see that the arrow itself is pretty small. You can change the look of the arrow from the properties panel or the inspector. Set the size to 10pt, color to black, and using the handles on the arrow, reposition it so that it is pointing downwards. Well, basic shapes are neat, but you are creating an interactive book for your fans, not a static one. How do you add things that people can play with? 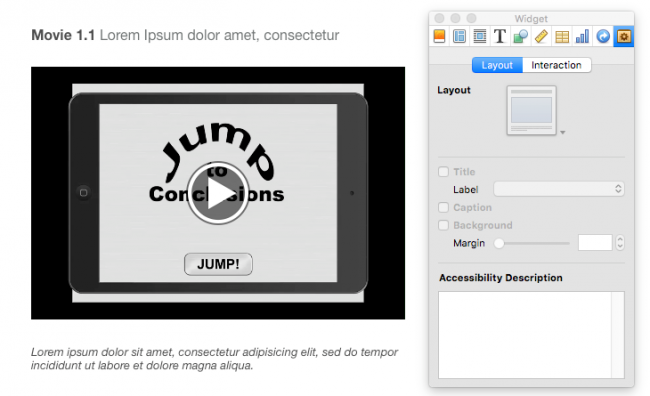 iBooks Author has you covered with Widgets! 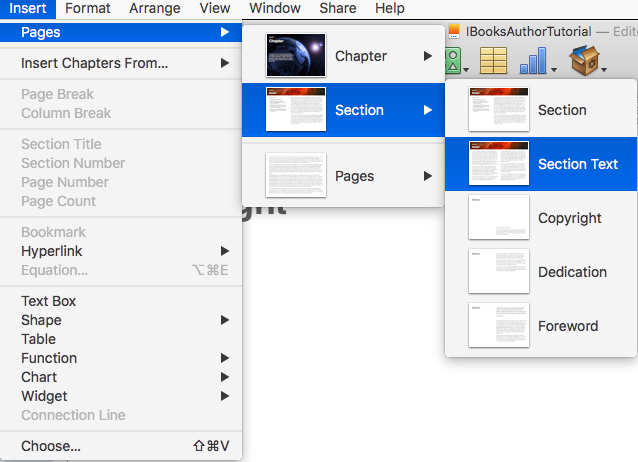 To insert different types of interactive media into your book, use the Widget drop down box at the top of the iBooks Author screen. You’ll be adding another movie to your iBook. In the Widgets drop down box, select Media. Save and Preview your iBook to see the video play! You’ll notice that if you tap on the video to bring up the video controls, you can choose to make the movie fullscreen on your iPad. Neat! Okay, interactivity is pretty cool. 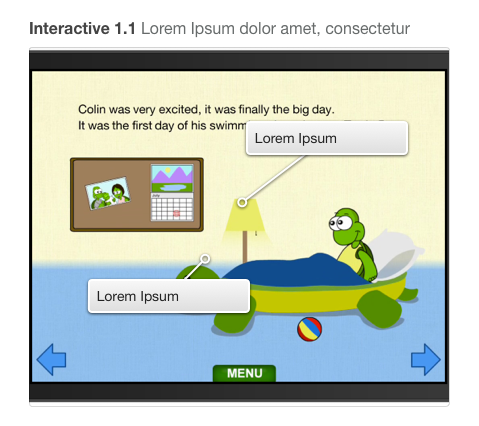 But what about interactive widgets that can help the reader learn as they go along? Yep, iBooks Author provides a widget just for that — the Revew widget! 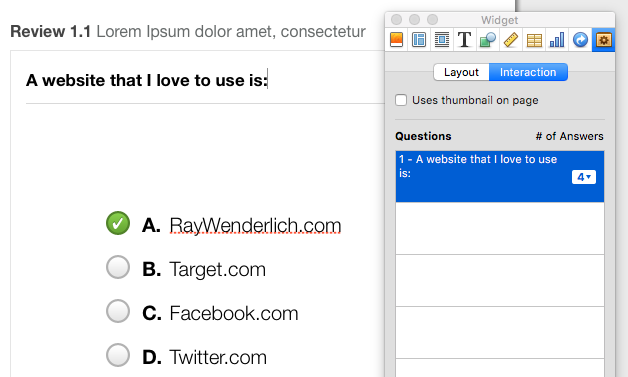 Another great tool available in iBooks Author is the Review widget, which allows you to create an interactive multiple-choice quiz for the reader. Using the Widget popup box, you can add multiple questions to present to your readers, as well as setting the number of answers per question. Add at least one question to your Review widget, and add a few possible answers. The Review widget can be very handy for educational books to test the reader’s comprehension as they go through your iBook. Regular review of the concepts and ideas presented in your book will greatly increase the reader’s ability to retain that new-found knowledge! So far you’ve covered interactive Video and Review widgets. 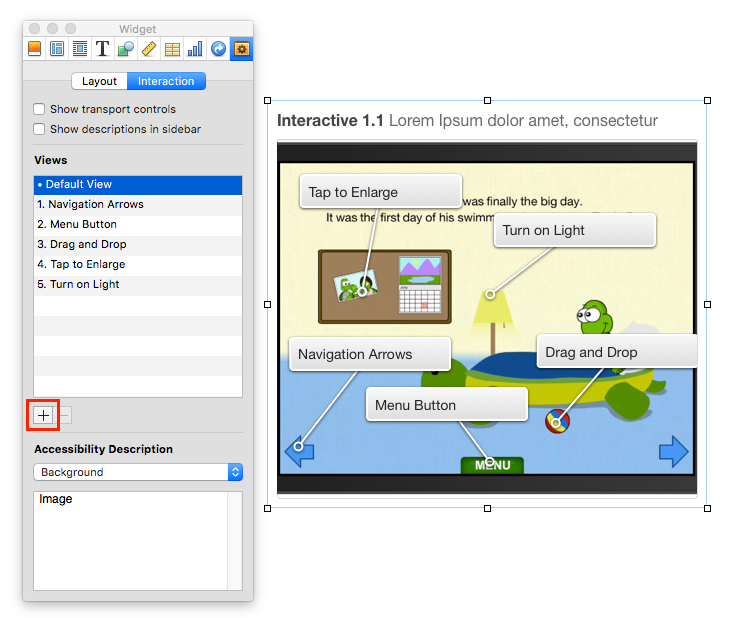 But that’s not all — images can also be interactive in your iBook! Another neat feature of iBooks Author is the ability to add illustrative images. These are images where you can tap certain areas to reveal special popups with additional information. These are great for calling out bits of detail or providing more context. You might use them to label a complex diagram, or places on a map. Create a label called Tap to Enlarge and point it towards the turtle picture on the bulletin board. Create a label called Turn on Light and point it towards the lamp. Create a label called Drag and Drop and point it towards the ball. Create a label called Menu Button and point it towards the menu button. Create a label called Navigation Arrows and point it towards the arrow. Sometimes you have a bunch of related images to display, but you don’t want them to take up too much space in your book. How does iBooks Author handle these sorts of problems? To showcase a collection of images, you’ll add a Gallery widget to your iBook. Select Gallery from the Widget menu and an empty gallery will appear on the current page. You can also add, remove, and reorder images in your Gallery by using the Inspector window. Interactive elements and text are nice, but books also need some kind of structure. It’s difficult for readers to get a sense of where they are and where they’re going without some sort of order or navigation structure. Now would be a good time to organize your Chapters and Sections! iBooks Author uses chapters and sections to structure your content. There’s no self-nesting allowed, so you can’t have a section inside a section or a chapter inside a chapter. You can, however, have sections inside chapters, which is how any good iBook is structured! 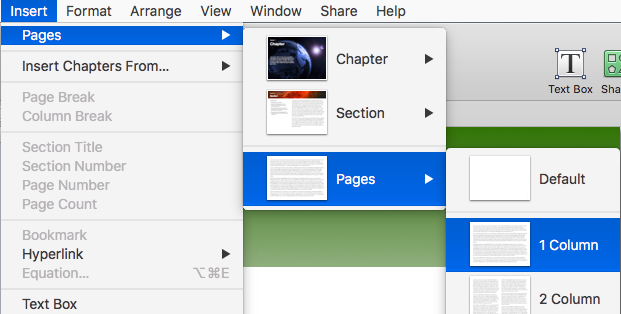 To create a new chapter, navigate to Insert\Pages\Chapter\Chapter. 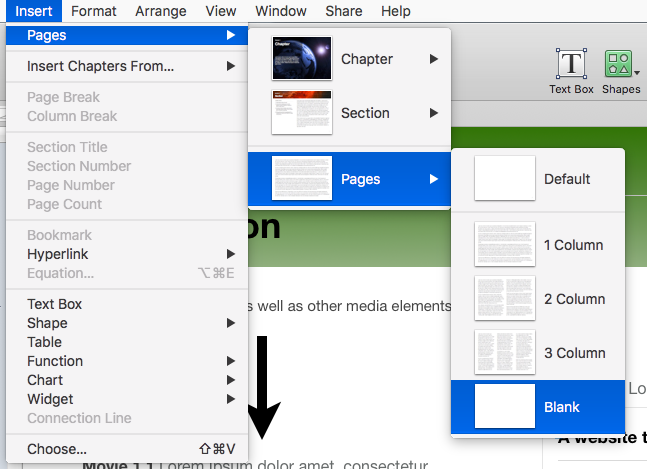 You can use the left-hand Books pane to move your new Chapters and Pages around to suit. 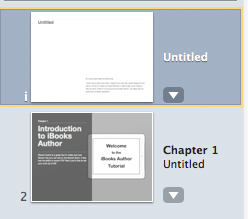 Creating a book in iBooks Author has been pretty simple so far. You’ve added your text, you’ve added interactive elements, and previewed the book on your device to make sure it looks and feels the way you want. Export your book in the iBooks format. Your book will have all the interactive elements and you can load it on your iPad or give it to a friend for their iPad. However, you can’t sell the book. 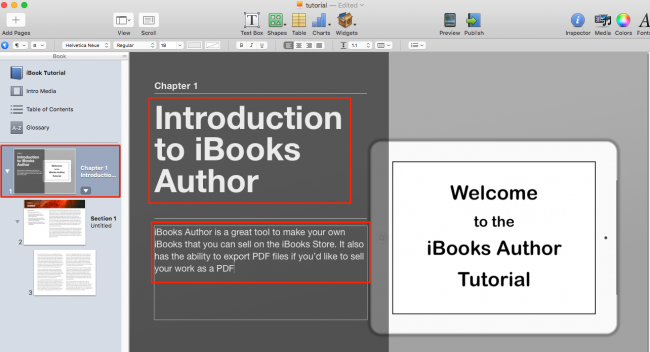 Export your book as a PDF. You can then sell it on your own, give it away for free, post it on your web site, etc. If your book isn’t media intensive, this is a great option since PDFs can’t have embedded video, image galleries, or other sorts of interactive content. Publish through the iBookstore. This is similar to releasing a song on the iTunes Store, or publishing an app on the App Store. You get 70% of any sales and Apple gets 30%. 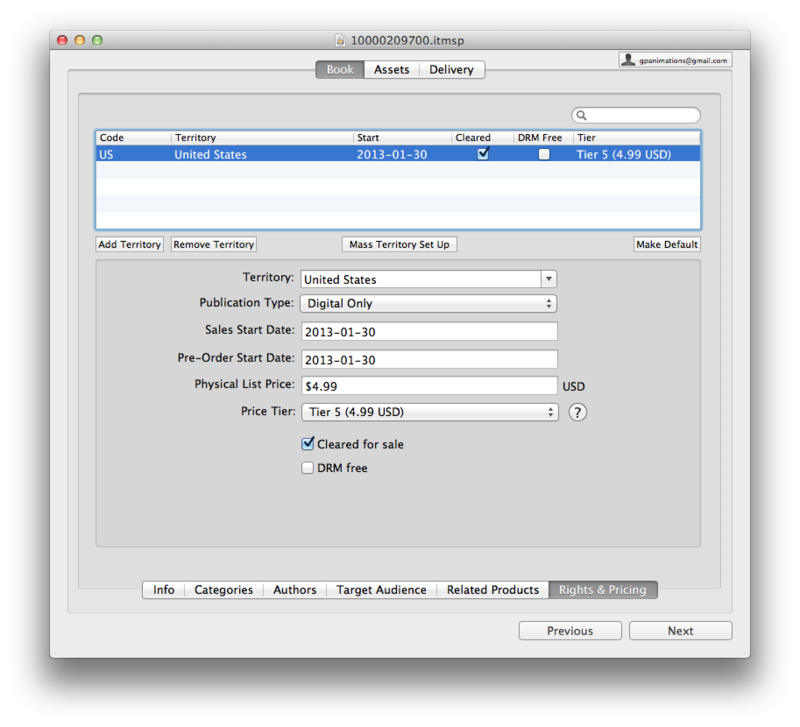 If you choose one of the first two options, you can simply export your book in the format of your choice and then distribute it however you like. 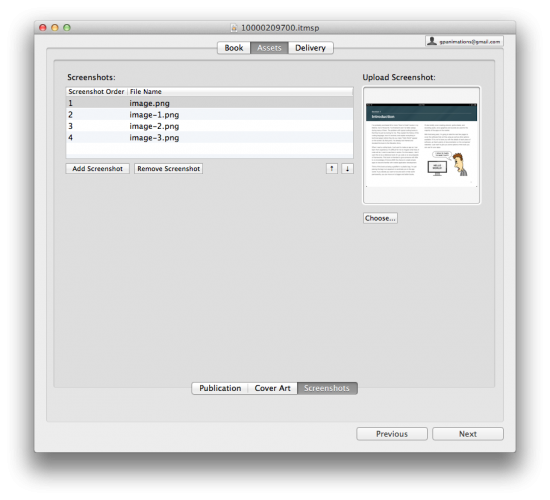 To simply export your book for distribution in iBooks Author, navigate to File\Export… Here you will see options to export your book as an iBooks file, PDF, or plain text document. 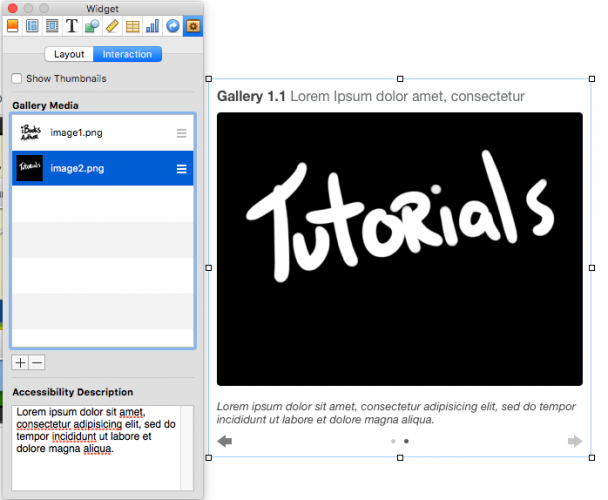 A plain text export strips all the interactive elements so you can use edit the book text editor. Simply choose your options here, hit Next, and follow the next few screens to finally save your file in the format you’ve chosen. As you can probably guess, selling the book through the iBookstore is a little more complicated! 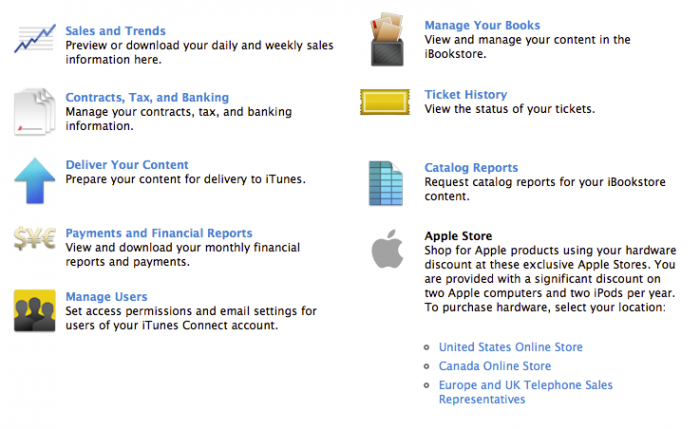 For those of you who choose to publish your books through the iBookstore, you’ll need an iBooks Account, which you’ll use in iTunes Connect. For those of you who are iOS app developers, you’ll need a new iTunes Connect account that uses a different email than your developer account. 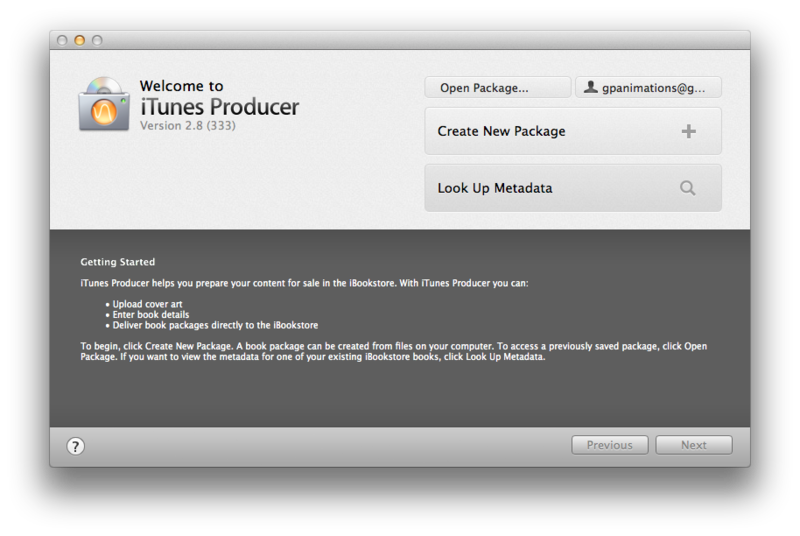 You’ll also need iTunes Producer to upload your iBook to Apple. 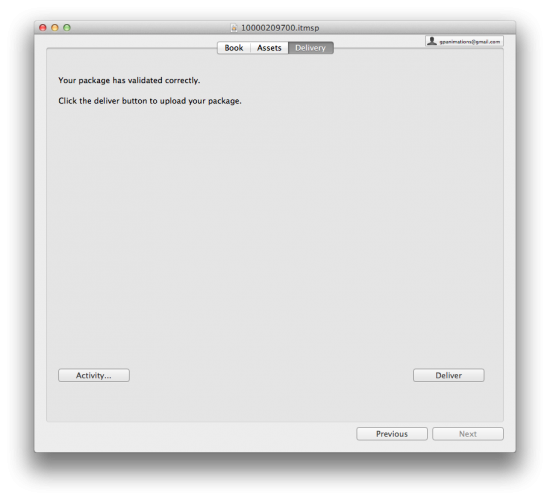 iOS developers, you can think of this as similar to submitting your app archive from Xcode. Note: The website you’ll need to create a new iBooks account can be found here. 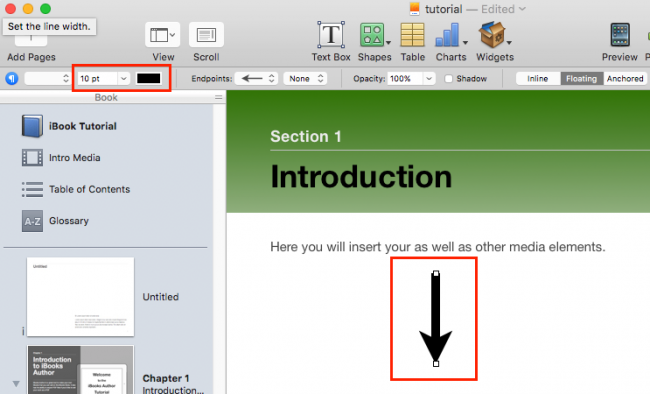 Now you’ll be asked to create a sample from one of your chapters. This is a great way to lure readers in, sort of like having super-appealing screenshots for your app. Once your book is live on the iBookstore, readers will be able to download a free sample. If they enjoy it, they will have the option of buying the full version. In iTunes Producer, you’ll need to fill out all of the information about your book. Go through each tab and carefully decide what you’d like to enter in each text field. This is also where you’ll upload your cover artwork and screenshots that appear in iTunes. Once you’ve uploaded your file to Apple, you can sign into iTunes Connect and check to see if your book appears under “Manage Your Books”. 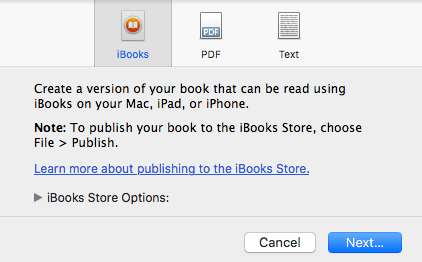 If you realize that you’ve made an error in the book after you’ve already sent the file to Apple, you can stop it from being processed by selecting the book in iTunes Connect > Rights and Pricing > Edit Existing Territories then change “Cleared For Sale” to “No”. 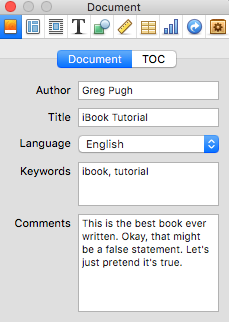 At that point, you can edit your book and re-submit it, using the “This is an update to a previously published book” option. Approval times for your iBook will vary. In my experience, my book was approved the same day that I submitted it. I was expecting to wait at least two weeks, so I didn’t even bother checking iTunes Connect to see if it had been approved or rejected! However, when I later logged into my account, I saw that it was approved in less than 24 hours and I had already been making sales. 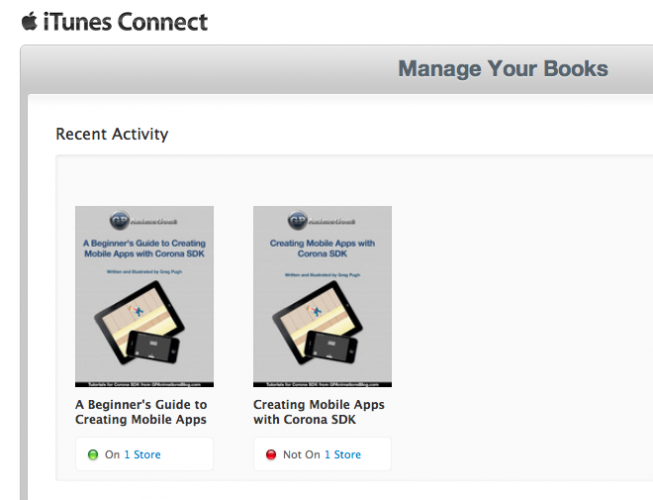 Personally, I have written an interactive eBook using iBooks Author called A Beginner’s Guide to Creating Mobile Apps with the Corona SDK, and have had a fair bit of success selling it on the iBooks store. Check it out if you’re interested! Here is a download for the finished example book which you created in this tutorial. 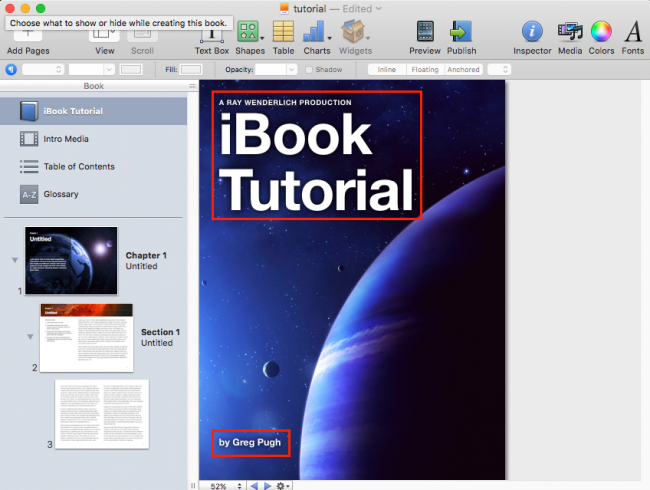 The sky is the limit from here now that you’ve seen some of the power of iBooks Author. You can create anything from a simple textbook to an enriched multimedia experience using a very friendly editing interface. And the best part is there’s almost no barrier to entry. You don’t have to worry about printing your books or finding a big publisher – just write your book, and get it out there for everyone to enjoy! I hope you enjoyed this tutorial, and that it inspired some of you to create an eBook of your own. 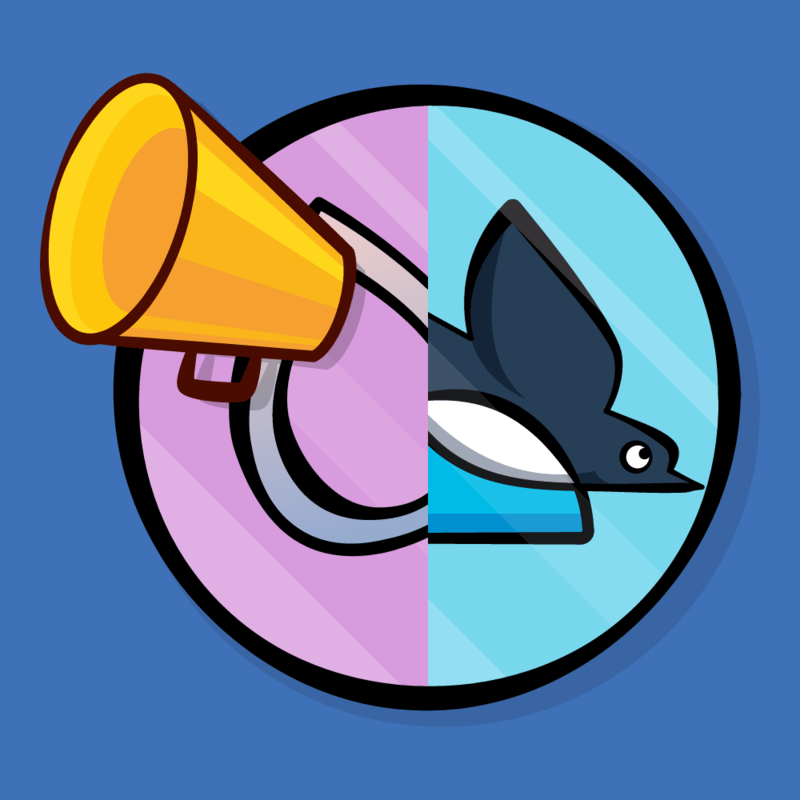 If you have any questions or comments, please join the forum discussion below!